I love Tetris. It’s one of the rare games I have played off and on for the past 20 years. But, I’d be lying if I said I didn’t think it could use a little extra something to mix it up from time to time. And sure enough, mixing it with fellow puzzle classic Puyo Puyo (Puyo Pop in the West) makes for an exceedingly fun puzzler. Puyo Puyo Tetris is actually more like a puzzle game collection than a single mixing of the two games. You can play normal Tetris or normal Puyo Puyo; you can play versus with one person playing Puyo Puyo and the other Tetris; you can even play both games at once, switching between them at set intervals. 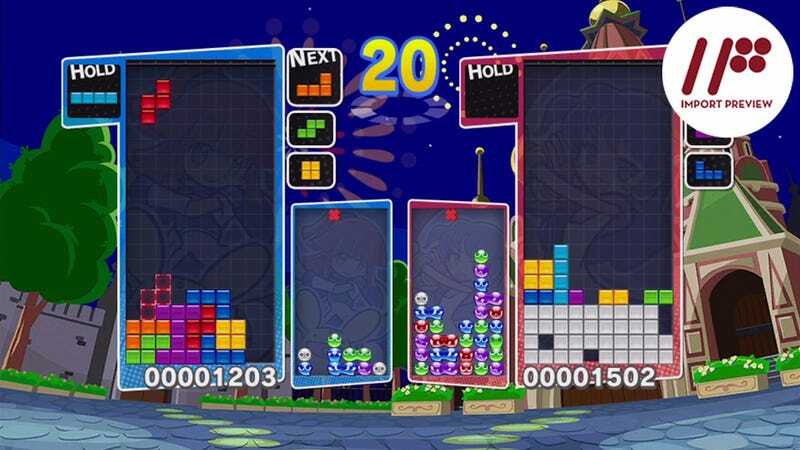 But that is far from all the game has to offer: There are other modes crossing over the two games—like where both Tetris blocks and puyos drop on the same screen and the Tetris blocks can squish the puyos as well as the game’s story mode (which we’ll talk about at length a bit later). It also has a variety of online and local versus modes. While available on the Wii U, 3DS, and PS3, Puyo Puyo Tetris is pretty much the perfect game for the Vita—especially if you also own a Vita TV. Versus matches against the computer usually last no more than three or four minutes so they are perfect for on-the-go-play. But if you’d rather play against real people at home, you can connect to the net wirelessly and play any of the game modes quickly and easily. There is also a built-in ranking system; so you should never find yourself playing against someone who is far better than you. I have to say, when I thought about Tetris games, the last thing that ever crossed my mind was “you know what this needs? a story.” Even further from my mind was the idea of making the Tetris blocks into anime-style characters. However, as the Puyo Puyo series has had a story and characters since the beginning, it's easy enough to understand why both were included in Puyo Puyo Tetris. In the game, the Puyo Puyo cast, expecting to see another horde of infinitely multiplying Puyos, instead see blocks falling from the sky. Investigating this odd mystery, they board a spaceship in orbit and come across the ship's crew of anthropomorphic Tetris blocks under the command of T. Together, the two casts of characters investigate what exactly is going on. Overall the story is little more than cute fluff, but it does give you a nice break in between matches as well as give a reason as to why you are battling each character. When it comes down to it, playing online or in the story mode, you have to be a decent player at both Tetris and Puyo Puyo to progress. Eliminating one row at a time in Tetris or only the minimum four blobs in Puyo Puyo just isn’t enough to cut it. Tetrises and puyo chains are the only way to go. That said, the story mode is relatively good at ramping up the difficult bit-by-bit, and there is even a training mode to let you practice strategies for each game type. However, as someone who while good at Tetris was a total novice at Puyo Puyo, it was a bit frustrating playing catch up. If you like Tetris or Puyo Puyo, Puyo Puyo Tetris is a game you simply need to play. It mixes the new and the classic in many varied and creative ways that you can’t help but be entertained by. If you have never played Tetris or Puyo Puyo but love puzzle games, don’t worry, Puyo Puyo Tetris is the perfect place to start. And for those of you wondering about importing a copy—while the Wii U and 3DS versions are region locked, the PS3 and Vita versions are region free. Puyo Puyo Tetris was released on February 8, 2014, for the PlayStation Vita, PlayStation 3, Nintendo Wii U, and Nintendo 3DS. There is currently no word on an international release.